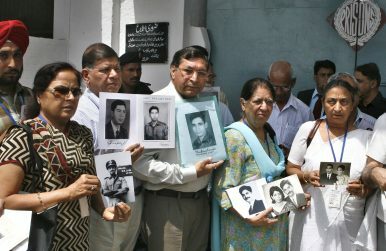 Family members of Indian prisoners of war show pictures of missing persons to the media as they arrive at Kotlakhpat jail in Lahore, Pakistan (June 2, 2007). Does Pakistan continue to detain POWs from the war? The families think so. In the weak December sunlight, the Indian Air Force Hawker Hunter began a second run to strike the heavily defended radar complex set atop the Sakesar Mountain in West Pakistan. Its pilot, Flight Lieutenant Gurdev Singh Rai, knew the terrain well. He had conducted the same bombing run the previous day, dodging the wall of anti-aircraft fire that rose like a curtain from the Pakistani ground forces deployed to protect the base. The 1971 war was only two days old and Rai was part of the enormous air offensive that would decimate its Pakistan Air Force opponents and cripple Pakistan’s navy. That would allow Indian forces in the east of the country to strike deep into East Pakistan and force the capitulation of its forces, resulting in the creation of the new state of Bangladesh. Unfortunately, Flight Lieutenant’s Rai’s short war was over. The hail of anti-aircraft fire from the ground batteries fatally wounded his aircraft. Rai crashed, and he was declared missing in action by his squadron later that day. Two days later and 4,000 miles away, his younger sister Rajwant Kaur was sitting anxiously in the front room of her modest home in North London. She was watching the BBC’s evening news coverage of the war and alongside her was her husband and their landlord. Suddenly she bolted from her chair and went to the television pointing at the screen. “There,” she said excitedly. “Thank goodness, there is Gurdev.” There on the grainy screen was her brother, dirty and battered but safe, standing in a line of prisoners of war (POWs) guarded by Pakistani troops. Relief washed over her. He would be safe now; however the war went he would come home. But Gurdev Rai never did come home. Rajwant waited days, then weeks, months, years, and finally decades for news, but she has never seen him or had official news of him since that grainy television picture. How could this be? Gurdev was a POW and protected by international law. In theory when the conflict ended just a few days later with a decisive Indian victory, completed lists of prisoners should have been exchanged via the International Committee of the Red Cross (ICRC). As POWs they would have been entitled to mail and fair treatment, and should have been repatriated as soon as possible under internationally monitored arrangements. The 90,000 Pakistani POWs were rapidly returned but the unknown fate of Flight Lieutenant Rai is not an isolated case. When Pakistan produced its list of 635 POWs, 51 suspected Indian POWs from 1971 were not accounted for — leaving their families grieving confused and over time to a large extent forgotten. The earlier conflict between the two countries in 1965 had left three other personnel still unaccounted for, bringing the total missing to 54 men who served in all branches of the Indian Armed Services. Major A.K. Ghosh was caught on camera by a Time newspaper reporter in late December 1971. A Pakistan radio broadcast in early December 1971 reported that Flight Lieutenant L.M. Sasoon, shot down while on a bombing mission, had survived the wreckage of his Canberra aircraft and was in captivity. The young wife of Flight Lieutenant Ashok Balwant Dhavale received his wallet, which included her photograph, and his scarf intact, but despite these personal belongings there was no apparent sign of his body near his wrecked aircraft. Wing Commander Hersern Singh Gill was by reports befriended by two imprisoned Pakistani officers jailed in Attock military prison in 1973-1974 for their role in plotting a military coup. Other reports suggest that up to 40 unaccounted for Indian prisoners were held in Attock Jail at that time. A Sikh prisoner repatriated to India reported a meeting in 1983 with a Captain Kamal Bakshi, whom he had met while serving time in Multan Jail. Captain Bakshi’s sister is British and still lives in London. As late as 2003, a Canadian human rights representative visiting Lahore Jail was called out to by prisoners claiming to be held from the 1971 conflict but was denied contact with them by his minders. Even more recently, in 2012, an Indian carpenter working in Oman reported he had been approached by a fellow Sikh who claimed to be Sepoy Jaspal Singh and said that he and four other Indian POWs had been held in Oman since 1975, in what would be one of the earliest cases of rendition. Pakistan has always denied any knowledge of the men. In 1982, Zia-ul-Haq, the military dictator of Pakistan, visited India. In a surprise move, he agreed to allow some of the families to have consular access to prisons where it was suspected the majority of the 54 POWs were being held. Six of the families travelled to Pakistan, although the heavily controlled visit yielded no sign of their loved ones nor clues as to where they might be. As the years have passed, the families’ faith in their own government’s actions in attempting to recover the men have been shaken. The Indian government seems unwilling to internationalize the issue. In 2015 human rights lawyer Jas Uppal, who runs the U.K. charity Justice Upheld, petitioned the Indian Supreme Court wanting the matter raised with the International Court of Justice as a matter concerning international law. As a result of her petition, the Court received an affidavit from the Indian Ministry of Defense in which it declared that it had no details regarding 54 missing defense personnel believed to be held captive as prisoners of wars (POWs) in Pakistan jails after the 1965 and 1971 wars. Uppal has had the question of the missing POWs raised in the U.K. Parliament, bringing the attention of the U.K. government to the fact that two of the missing POWs have sisters who are British citizens. However, the Foreign Office declined to become involved, referring to the matter as a bilateral issue between India and Pakistan. Uppal does not consider that good enough. So, what happened to the missing 54 POWs? There is much evidence that these men survived the combat phase of operations and Pakistan has a history (which continues today) of conducting extrajudicial detention. Its jails hold detainees who fall into special categories of prisoner, determined by the nation’s powerful security apparatus rather than the courts. Many believe that the fear of prosecution by the new nation of Bangladesh for war crimes committed by members of the former Pakistan military meant Indian POWs were held for use as bargaining chips against such prosecution. Over time the prisoners became an embarrassment — possibly to both sides — as the turbulent diplomatic relationship between the two countries never produced the right time to reveal their existence. The men have never faded from the memory of their families, who keep hoping to learn the truth of what happened to their loved ones following that short war. Numerous appeals for information and legal applications to both governments and the international community have led nowhere. Sadly, for Rajwant Kaur, a serious car accident has left her confined to a wheelchair. Yet she still waits, patiently sustained by the hope that one day her brother will walk into the room where she lives alone in a North London suburb and they will be reunited. Elsewhere, when Indians celebrate December 16 as “Vijay Divas” (Victory Day) the families to whom the 54 POWs never returned will have mixed and muted feelings as they wonder whether their loved ones remain hidden after all this time behind a Pakistani prison door. James Maclaren is a UK-based freelance writer with extensive experience in defense and security matters. He is a contributor to Janes Defense Weekly, the Asia Defense Journal and has been published in the Singapore-based Straits Times. Why is there an assumption that nuclear weapons would preclude a limited conflict between India and Pakistan?